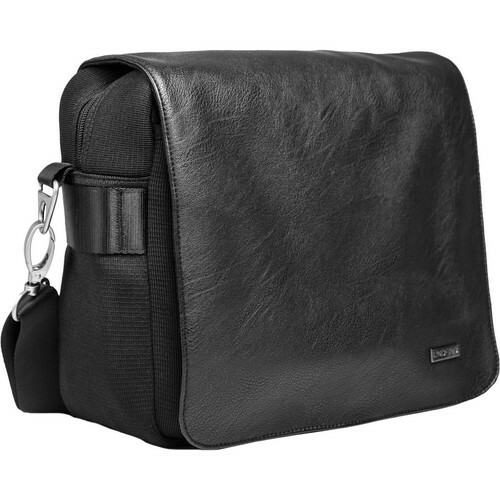 The black, leather One Bag 10" Laptop and Camera Bag from UNDFIND is designed to hold your DSLR with three lenses and accessories. It's also sized to hold your 10" tablet/notebook in a separate sleeve. The small width design gives the bag a small profile while its depth allows the bag to hold a lens attached to your camera. The padded insert includes movable dividers that allow you to sculpt the interior to suit whatever gear you need on a given day. Remove the insert and you have one large storage space for personals or other items. The leather covered neoprene bag includes neoprene pockets for small accessories such as memory cards, batteries or business cards. The nylon shoulder strap secures to the bag with leather bindings and the bag's designer shoulder pad is made from wetsuit grade neoprene. Your tripod can be attached to the bottom of the bag with touch fastened straps that can be removed when they're not needed. In addition, the bag can be expanded by the use of accessory straps on the side of the bag that accept optional pouches. Access to your gear is via a full length zipper on the top of the bag. For carrying purposes, the bag includes a designer nylon strap and trolley sleeve that is used to mount your One Bag 10 over an optional rolling luggage cart. For foul weather, the bag is equipped with a rain jacket that can be stored in one of the bag's pockets. UNDFIND provides a series of optional, swappable designer covers that can be used to change the outward appearance of the bag. The bag is backed by UNDFIND's 90-day warranty. Box Dimensions (LxWxH) 14.1 x 10.6 x 4.6"
One Bag 10" Laptop and Camera Bag (Black, Leather) is rated 4.2 out of 5 by 44. Rated 4 out of 5 by Claire Watson Photo from great for swapping lenses I use this bag solely for swapping lenses during a shoot. I have a bigger bag that holds the bulk of my equipment, but don't want to carry that around with me for a long day or when I need to be more agile. This bag doesn't have any scratchy material on the inside so I can feel comfortable leaving a lens cap off during a quick change if need be. I typically have my 70-200 in one side, a prime in the other, and another prime on my camera. The bag also has lots of spots for things like your phone, keys, and camera cards. I also like how it feels on my shoulder, neck, and body. It's a very comfortable material. It is a little pricey, but I'm happy with my purchase. Rated 3 out of 5 by JT from 10 version is very small for a guy, better to get the 13 The One Bag itself is quite nice with comfortable and durable feeling material. The stone gray cover is fairly dark and makes the bag less feminine so suitable for guys as well. The One Bag 10 is actually quite compact, smaller than I expected based on the measurements given. Despite the size, I managed to fit a Canon 6D with 17-40/4 lens attached and a 70-200/2.8 IS lens (lens hood reversed) in the bag with the zipper done up and flap closed so it is a very functional bag, probably good for travel. For my purposes though I wanted a slightly bigger bag so I exchanged this for the One Bag 13 instead. Rated 4 out of 5 by Melvin from Nice travel camera bag for Sony A6000 plus accessories I used it on vacation tocarry my Sony A6000 with 20mm f2.8 attached, Rokinon 12mm f2, Sigma 60mm f2.8 plus the Nissin i40 flash. I also included a few extra batteries (AA and Sony) and memory cards. It carried everything without a problem - bag was made to carry a dslr with a spare lens and flash. The only reason I didn't give it 5 stars was because the shoulder strap kept loosening up and required adjusting throughout the day(s). It also would have been nice to have two extra pads to help separate (only comes with one extra). Other than that, it feels pretty sturdy and is a nice looking bag to carry on vacation without looking like a tourist/photographer. Rated 4 out of 5 by Hyunjin from Very tight I try to like this bag but after one day of using it,I put in my storage. First, space is very tight and with it's small opening, it is very hard to get the camera out. By the way, my camera is olympus omd em 10 mk2 (small camera). Secondly, bag is heavy even with minimal contents. I put omd em10 mk2 with 3 tiny lenses and wallet and it feels ton. Also no side pockets. Now, to be fair it is very well made and a lot of thought went into this bag. It is just not for my use. Strap is the most comfortable I ever had with swirl clip. It would be perfect bag for ladies who carry light items. I give 1 star for my personal use but I would give 4 stars for overall quality. Rated 5 out of 5 by MariaSG from Perfect for Weddings I bought this to carry it around on weddings, with the appropriate extras for each part of the day, and for that it was perfect. I could leave my heavy back-pack behind because I had all I needed. I could fit my 5D Mark iii with a lens on and two primes on the side, or you could fit 3-4 lenses depending on the lenses. The strap is very comfortable, the pockets very convenient, and I think this is the least popular size but I think it is the perfect size to carry just what you need. Next portrait session this bag is the only thing I am bringing with me. Rated 5 out of 5 by Margaret from Great light weight gear bag This bag is great for carrying that extra lens, cards, remote, batteries etc for a shoot where you don't want to have to sling a backpack off your back or set it down to access stuff. It is very lightweight and stretchy with a nondescript cover flap that doesn't scream camera in here. You can even put the whole camera in there although that limits how much other stuff you can add but would be great when you want to put the camera away for a bit. That 10 won't fit much of a laptop but you can put an iPad in there although I'm not sure I would do that with the camera as it stretches it pretty good. Rated 3 out of 5 by Alyson from Love the design, not as versatile as advertised. I own a Canon Mark IV, and switch between a 50mm and 100mm. Storing my camera as suggested in the photograph on here makes the bag bulge out. I managed to fit my flash, camera with 50mm attached and the 100mm in the insert and it is EXTREMELY tight. The thing I'm the most disappointed over is the little business card or id holder. There is some kind of stain on the plastic, which I tried to remove from both the inside of the pocket and the outside, that will not come off (photo attached). My friend had this same bag and I fell in love with it ( i think it was the 13 inch), so I'm wishing I would have gone with that. I feel like not a lot of care went in to the design of the 10 inch. Rated 2 out of 5 by TonyR from It's okay, but I wouldn't recommend it. I got it at a cheap price, so with this in mind, I got what I paid for. It's not sturdy, the walls inside fold inward if nothing pushes up against them. It's good if you want to bring along a second lens and a flash, for example. But a DSLR with lens does not fit well, at least not my 5D. Maybe it's good for smaller cameras, definitely not for full frames. I carry my camera with a lens on one shoulder while this bag on the other. Hopes this helps.